As with any self respecting father born in the 70s, I have a responsibility to ensure that my son become obsessed with Star Wars like his old man. The brainwashing began before he was born when I tried to talk the wife into the names Boba or Darth (surprisingly, she had other ideas). After he was born, I made him up a number of onesies with iron-on print outs of most of the Star Wars universe (I probably shouldn't admit that. I am sure George Lucas is going to be knocking at the door any minute now). As soon as he was old enough to watch a movie all the way through, I popped a sizable amount of popcorn and began the education by setting up a drive in theatre in the living room (o.k. it was just a blow up mattress, but he was 3) and showing him A New Hope. At first, I thought he was bored, but eventually he started to ask me questions (Who is that big doggy? Chewbacca. Why is that guy breathing so hard? Asthma. Did Han shoot first? Of course.) and I knew he was an eventual member of the Cult of Star Wars. We have since watched many of the films and continued to build our bond over Boba Fett and Bantha Fodder. 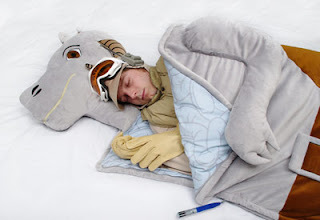 That is why I was so excited to see the Tauntaun Sleeping Bag from the good folks at ThinkGeek. For those of you unfamiliar (and how dare you for not knowing this), a Tauntaun was a two legged beast that looked like the result of a drunken night between a camel and a kangaroo. It was the primary transport for the Rebel Alliance on Hoth (if you don't know what I am talking about at this point, please turn off your computer and head to a store and buy the trilogy now). At a very pivotal point, Luke is lost in the snow and Han is sent out to look for him. He finds Luke almost frozen to death.The Tauntaun that Han was riding was done and it dies. In the ultimate symbol of friendship, Han takes Luke's lightsaber, splits open the side of the beast, and places Luke inside it's warm gooey goodness. This is high on my list of must-have presents for this Christmas... and maybe I will get one for my son too. May the force be with you.